I really believe that both of these keyboards have their benefits. The Stowaway obviously has the benefit of being a full keyboard. The numbers keys are where you would expect them, and you can interact with it "normally." 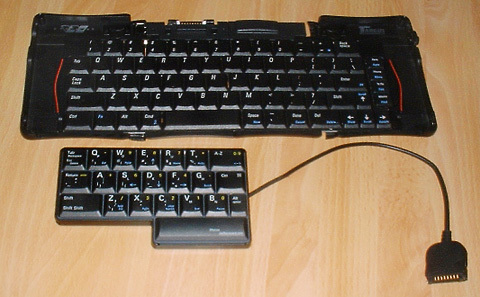 On the other hand, the HalfKeyboard is not a full keyboard, but has all the functions of one -- albeit trying at times. The HalfKeyboard has real "wow factor." As I sit at the UW campus typing this up, nearly every person who has passed me by has practically stopped and stared. I chalk this up to the amazing HalfKeyboard, or it could be my stunning good looks. Hmmm. Probably the former. I find the HalfKeyboard a lot easier to actually set up. There's no unfolding and "popping" into place. With the HalfKeyboard the setup process is smooth, and I believe, it's ultimately easier on your Visor than slamming it into place on the Stowaway. The major benefit of using the HalfKeyboard is that you can use your stylus seamlessly while typing. Your right hand is free to tap, tap tap...which we all know is half of the data entry process on a PDA. This feature alone makes the HalfKeyboard worth looking into. The Stowaway does not have this feature. When I use my Stowaway I'm constantly docking my stylus in either side or holding it in my mouth. That's a real pain. Granted, if you are in the habit of writing novels on your Visor, this may not be the keyboard for you. But if you are looking for a keyboard that is small, really portable, functional, and easy to set up, the HalfKeyboard is a valid choice. >How does the HalfKeyboard compare to the Stowaway?